The vacations to St. Josè spend to the insignia of a particularly relaxing calm with some between the beaches and the most beautiful landscapes of the island. The tourists that rent one of the luxurious villas to St. Josè feel indeed him as if they were in a heaven. Placed to west south, the village of St. Josè sits on the side of the tallest mountain of the island, Sa Talaia (475m), and it is a refined place with cafe, some famous restaurants that serve tapas and pizzas, shops, typical roads and a church-fortitude that it goes up again to the 15° century. The diversion to St. Josè is offered in very refined way, here they play often musicians jazz and blues or he can be taken advantage of the cinema to the open one that, in summer, it projects film as “Laurel and hardy”; all of this to alone 5 minutes from some of the most picturesque beaches that Ibiza has to offer. The good connection with Ibiza city and San Antonio, make the villas vacations and the setups in this area a good choice, situated to half road among the two places and far less than 10 minutes of car from both. A small village composed from few hidden villas of country, punctuated around the church, a cafe and a small supermarket. The sight from the of out in the countries of St. Augustin it composes a perfect picture, the valleys and the hills they have covered of almond tree and other trees, the solos sounds that feel him are the songs of the crickets. This beach is wet from the cleanest waters of the Mediterranean, three lines of intense sand, edged by a rocky wall that leans out on three islets that make this place the preferred one is from the tourists that from the local inhabitants. Placed in the more point to south of Ibiza, this beach is the perfect place to assist to an idyllic sunset, even sipping champagne in one of the refined bar/ristorantis. Her villas in this zone have in fact a spectacular sight. Small but popular among the tourists, on this beach they are present some bar/ristorantis and shops of souvenir. 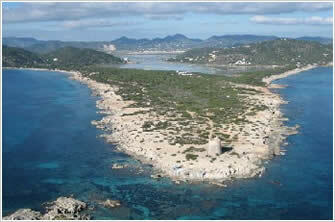 The beach has a splendid sight of the mysterious island of Es Vedrà, to few footsteps from the shore. Source of many myths and legends, is a place of sightings of ufo. Believed by some to the sacred island of Tanit, others see it as the island of EPI Homeric sirens. It also seems to be the third point of the magnetic ground (in this zone compasses do not work). 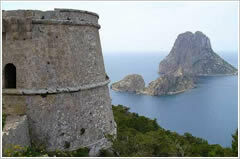 A prominent 378m high rocky island, populated only by wild goats and a colony of endangered species of Falconi of Eleanor, who often are seen flying over Es Vedra. This “rock” also appears in the film “South Pacific” as the mysterious island of “Bali Hai”. The villas that overlook Es Vedra are in a wonderful position, sought by the “veterans” of Ibiza, tourists, as well as by celebrities. A small sandy cove from the forest and from the hills. The beach is silent and calm indeed, the favorite for more from who practises immersions, and with two bar/ristorantis. But above every other thing this is an ideal place to catch the sun and to relax during the long summer days of your vacations. This beautiful and picturesque village, surrounded by fields of citrus fruit, it will conduct you to three small beaches. Es Cubells is positioned in such way that almost all the villas and the setups that it entertains have a splendid sight of the Mediterranean and it have, besides, the exclusiveness and the safety of a reserved urbanization as some restaurants and small shops. The road to peak on the bluff will conduct you to some beaches is sandy that with pebbles of the outskirtses and to other good restaurants. Founded by a monk carmelitan father Palau The Quer, that the Vatican convinced to finance the construction of a chapel in 1855, the village it is worth only also a visit for fantastic panoramic sight. A long ample beach of end white sand and cleaned clear water, edged from hills urbanized with luxurious villas. 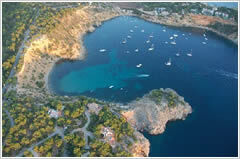 Cala Tarida it is favorite from those people that look for a perfect house vacations. The place is family and friendly and entertains cafe, restaurants and evening diversions without absolutely giving you that feeling of marketing of the other tourist places. It walks along the beautiful bluffs that surround you, making to abduct you from one of the most beautiful sights of Ibiza, or you make immersions along the marvelous coast studded by colored fishes of different kinds.